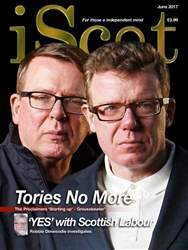 Digital Subscriptions > iScot Magazine > June 2017 > Why not come on down? Why not come on down? iScot’s DAVE BOWMAN looks ahead to next month’s 133rd Durham Miners’ Gala - or the Big Meeting as it’s called in north east England - and says Europe’s biggest annual community and trade union gathering is one of Britain’s best days out. And there won’t be a Union Jack in sight! FOR an event that almost died on its feet in the late 1980’s and early 1990’s following the decimation of the mining industry by Margaret Thatcher’s industrial vandals, the annual Durham Miners’ Gala is in rude health. The ‘Nasty Party’ Tories are Back! We don’t need more democracy!